Master any terrain with the off-roading power of a Jeep. Trail Rated® models like the 2018 Jeep Wrangler offer a great selection of features to make your experience safer and more fun. You’ll find features like the all weather capable Jeep Brand 4×4 systems, high air intake and sealed body/electrical components for water fording, and tow hooks to pull you out of the biggest mess. You’ll be able to tackle anything in your way. No matter how difficult or tricky the terrain, your Jeep can be equipped with everything you need to make it safer. Conquer the road less traveled with Jeep. 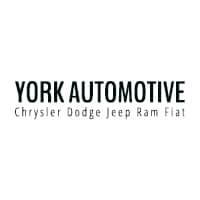 Start your next adventure at York Chrysler Dodge Jeep Ram FIAT. Find your new Jeep at York Chrysler Dodge Jeep Ram FIAT near Lebanon and start your adventure today. Get pre-approved for financing to hit the trails faster and then head over to our Crawfordsville location to find your perfect Jeep today!